From northern California and southern Oregon, this species is often seen growing along drainage ditches. One easily found colony is near O'Brien, Oregon off Highway 199 is shown in the insert photo. Note the wild dasies growing in with the bulbs of Lilium vollmeri indicating the high moisture content of the soil. The brightly colored Turk's Cap flowers vary in color from nearly solid yellow to golden-red. Most commonly they are medium orange with black spots and yellow centers. 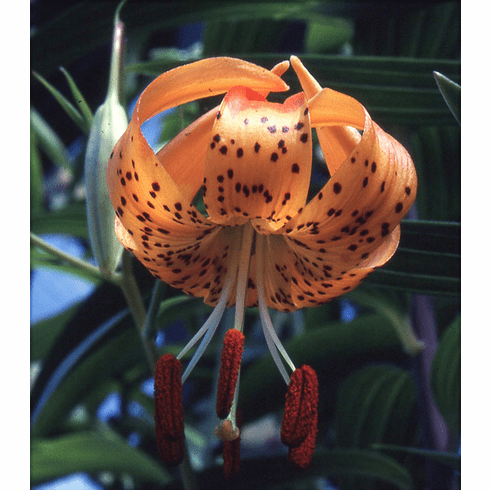 More difficult than Lilium pardalinum which it resembles, a deep and damp, but free draining soil is necessary for success in the garden. We have found this lily in ditches containing standing water that were more robust than those growing in better drained soils. Title photo is of 'L. volmeri' growing in cool greenhouse. Inset photo #1 is of roadside colony near O'Brian, Oregon.